Very important set of both blade with custom ordered mount for a Daimyo. 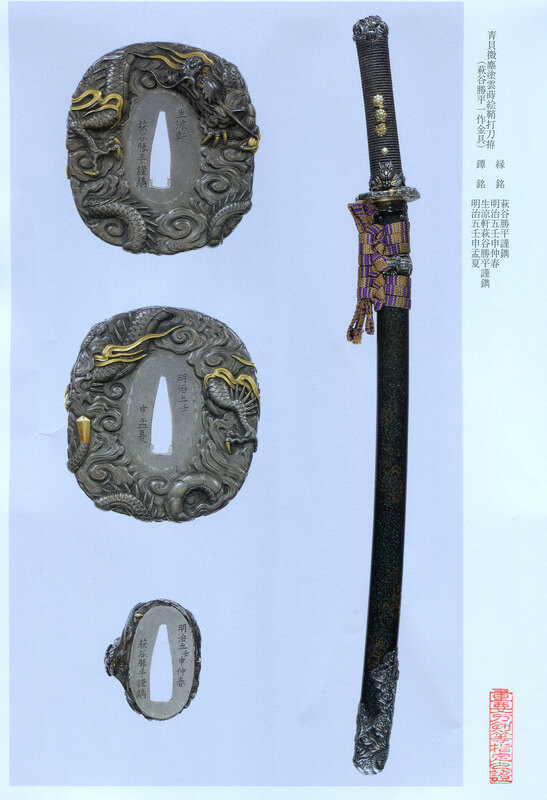 The Tsuchiya family listed this blade as one of their family treasures (on the list it was called a “Masamune”), and cherished it for many generations when they still had power. During the 1800’s the current Daimyo of the Tsuchiya Kei ordered a custom mount to be made for this blade from the top kinko maker from Mito, Hagiya Katsuhira. Sometimes well to do Daimyo ordered special mountings made as a type of (show off) piece for social events, just like what people do today with cars and jewelry. The blade is a very nice Soden Bizen blade loaded with lots of activity. The hamon is a well formed gunome choji midare with both mimi gata and saka choji. Ashi , kinsuji are seen throughout the hamon that is made up of nie and ko nie. The jigane is a beautiful itame mokume mix with tobiyaki and strong utsuri. The extended kissaki is done in the style that was popular during the Nanbokucho period and the boshi is done in midare komi. Blade is flawless and in an excellent sashikomi polish. There is much debate whether or not this sword is a Kanenaga (Kencho) or Nagayoshi (Chogi), but either way it is an excellent example of a Soden Bizen sword from the 1300’s. The mountings are so outstanding the pictures cannot capture the 3d detail of the carvings. 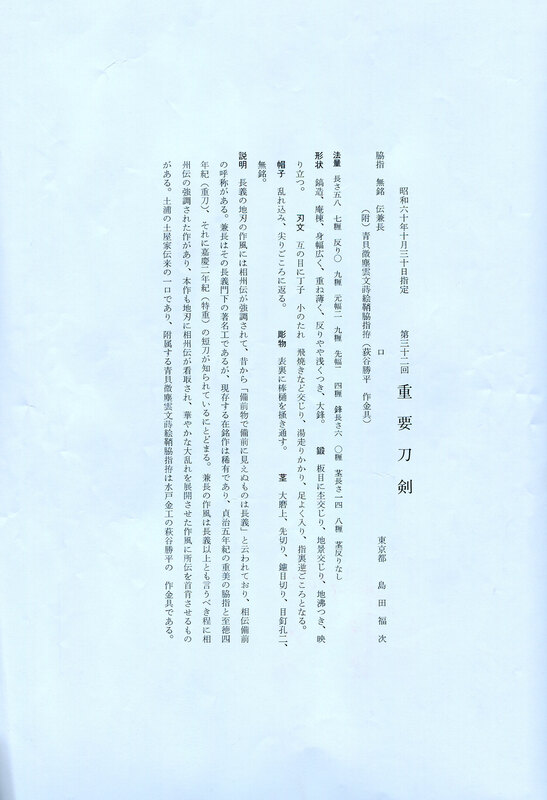 Basically it is a complete mount made by Hagiya Katsuhira (kappei). Done in top grade shibuichi with shakudo and gold for the accents, this mount is unbelievable in hand. Ultra high relief dragons done with finely cut clouds make up the theme. The menuki are of solid gold with the design of the Tsuchiya family kamon. The lacquer is top quality aogai (green type only) with smooth gold and silver clouds as the design. 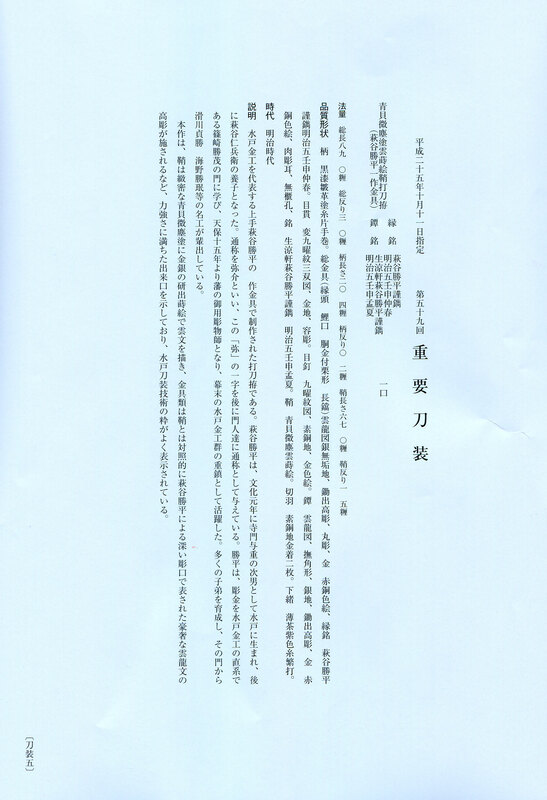 According to the NBTHK, it is possible that it took Katsuhira 1 year to make this mount, and with the date of manufacture being so late, it is also possible that this is the last mount that he made due to the edict for banning the wearing of swords. 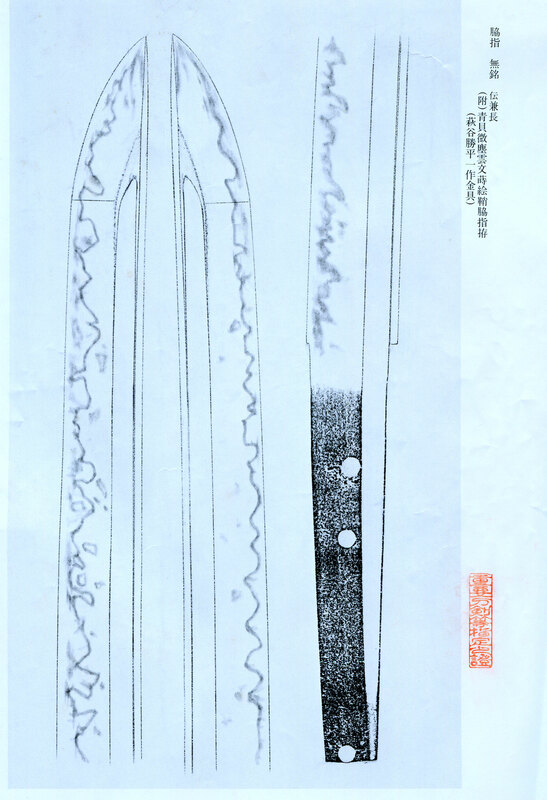 Another interesting fact is even though this blades length is technically a Wakizashi, this sword is mounted as a katana, and in some special cases, these types are classified as “Chissai katana” as often Daimyo and other upper level samurai did not like to carry a long blade at times. NBTHK Juyo Token. Was featured in LACMA Art of the Samurai exhibition.